A cruise liner that ran into trouble in stormy seas off Norway reached port under its own steam Sunday after hundreds of passengers were winched to safety by helicopter in a spectacular rescue operation. 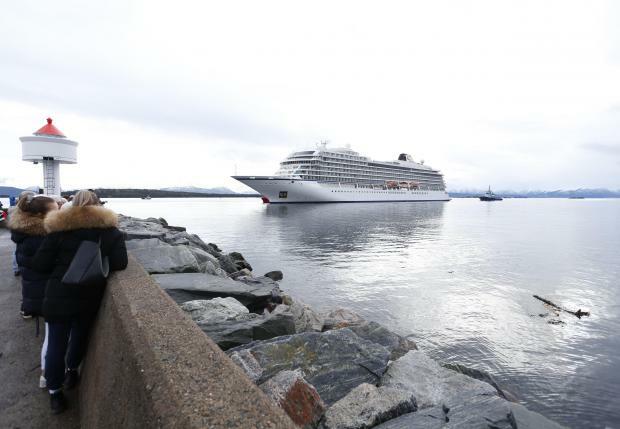 Escorted by tugboats, the Viking Sky arrived in the port of Molde at around 4:15 pm (1515 GMT), television images showed. Nearly a third of its 1,373 passengers and crew had already been airlifted off the ship. The cruise liner lost power and started drifting on Saturday afternoon two kilometres (1.2 miles) off a stretch of Norwegian coastline notorious for shipwrecks. The captain sent out a Mayday prompting authorities to launch the airlift in difficult conditions rather than run the risk of leaving people on board. Some 460 of the 1,373 people on the ship had been taken off by five helicopters before the airlift was halted. Police said 17 people had been taken to hospital. One person more than 90 years old and two 70-year-olds suffered serious fractures. With three of four engines restarted Sunday, two tugs towed the vessel away from dangerous reefs before it set sail for Molde, 500 kilometres (300 miles) northwest of Oslo, under its own power. Dramatic footage of the passengers' ordeal showed furniture and plants sliding around the lurching vessel as parts of the ceiling came down. Dozens of passengers wearing life jackets were seen seated waiting to get off the ship. "I have never seen anything so frightening," said Janet Jacob, who was rescued. "We were sitting down for breakfast when things started to shake... It was just chaos," said another passenger, American John Curry, as quoted in Norwegian by local media. "The best word, I guess, is surreal," he said. "Sea water six-seven feet (about two metres) high just came rushing in, hit the tables, chairs, broken glass and 20-30 people just... went right in front of me. "I was standing, my wife was sitting in front of me and all of a sudden, she was gone. And I thought this was the end," Horgan said. But it all ended well for Ryan Flynn. "Here's my 83-year-old dad being airlifted from the #vikingsky," he said. "We are all off the ship safely!" The ship was sailing south from Tromso to Stavanger when engine trouble struck mid-afternoon on Saturday in an area off More og Romsdal that has claimed many vessels. "It is dangerous to encounter engine problems in these waters, which hide numerous reefs," said Tor Andre Franck, the head of police operations. A reception centre was set up in a gym on shore for the evacuees, many of whom were elderly and from the United States and Britain. 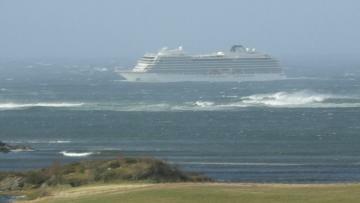 Operated by the Norwegian firm Viking Ocean Cruises, the Viking Sky was launched in 2017 with a capacity of 930 passengers plus crew.